Protopresbyter Alexander Schmemann: Metropolitan Philip, "I have fought the good fight"
We are gathered here this evening in this chapel and on this holy hill to pray for the repose of the soul of our departed friend, Father Alexander Schmemann. Death in human experience has never been easy, whether it comes in youth or in old age; whether it strikes suddenly or after a long illness, it always leaves in its wake loneliness, tears and longing. Let us pray that our Merciful Lord will give Matushka Schmemann and her family divine comfort and consolation. We are not here to mourn like those who have no hope. We are here to contemplate and to celebrate the life of Fr Alexander Schmemann, a great theologian, a distinguished professor, an articulate lecturer, a renowned author, an organizer and a builder. The sixty-two years, which Fr Schmemann lived on this earth, have been a pilgrimage and a journey which started in Estonia, went through France and ended here at this Seminary which consumed his life and to which he gave every ounce of his energy. I honestly do not know of any contemporary Orthodox theologian who has left more impact on our theology, spiritual lives and thought than the Right Reverend Alexander Schmemann. "Whosoever shall do and teach, the same shall be called great in the kingdom of heaven." (Mt 5:19). Certainly his untimely departure shocked all of us, but in the final analysis, it is not how long we live, it is rather how deeply we live, how many candles we light and how many chapters we write in the Book of Life. I am sure that all of you are aware of the many books, which Fr Schmemann authored during his life. I would like to mention, however, only one of them, For the Life of the World. This excellent work has been translated into eight languages and as The New York Times stated yesterday, "this book remains one of the most widely read books on Orthodox Christianity written for the general public." 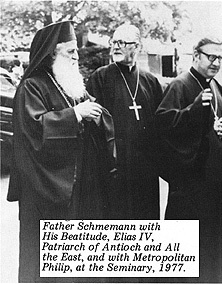 Fr Schmemann popularized Orthodox theology and brought it down from its ivory tower to the peoples level. He lectured to academicians as well as to the smallest congregations in North America. Fr Schmemann was a pioneer in the field of Liturgical Theology, and I would dare say he is the father of Liturgical Theology in the Orthodox Church. His relentless emphasis on the eucharistic experience as a journey to the kingdom, created a spiritual renaissance in thousands of parishes throughout the Orthodox world. I was fortunate to have been one of his students. He touched my life as well as many lives in this country and abroad. As professor of Liturgical Theology, his lectures were never dull. No matter how serious the subject was, Fr Schmemann would always inject his wit and humor and make it most interesting. We looked forward to his lectures with much longing because he made God, the Church, the sacraments, the liturgy and even Byzantine history very much alive in our minds. Both in France and in the United States, he educated Patriarchs, scores of bishops and hundreds of pastors. As Dean of St. Vladimirs Seminary he worked tirelessly to bring the seminary from its humble beginnings to the fine institution it has become today. Since the beginning of my episcopate, Fr Schmemann and I developed a very deep friendship and shared many, many intimate thoughts about the seminary and the future of Orthodoxy in this hemisphere. Oh, how hard he worked and preached about Orthodoxy in this land! His burning desire was to see Orthodoxy organically united in North America. Unfortunately, he died before the realization of his dream. We shall continue to struggle for this unity and we shall dedicate our efforts in this regard through the Bilateral Commission to the blessed memory of Fr Alexander Schmemann. Despite his tragic illness, he continued to travel and speak on behalf of the Seminary and Orthodox unity in this hemisphere. Last July, he honored the Antiochian Archdiocese with his presence at the Convention Banquet. At the conclusion of his speech in which he reflected on the conditions of Orthodoxy in America, he said, "It may have been very useful, very necessary to discuss in detail various ecclesiastical problems, but when Christ touches us with the light and the joy of our ascension with Him to the Kingdom of God and the Table of the Lord, then we understand the real scope of American Orthodoxy. Defeat transformed into victory; death destroyed by death; darkness absorbed by light; suffering made into a way to Christ. Such, for us, is the meaning of the Church, and one cannot escape it." Nothing worthwhile in this life can be achieved without struggle, and suffering will always lead to Christ if it is understood in the light of the cross. This was the firm conviction of Fr Alexander Schmemann. The German poet Goethe once said: "He who does not eat his bread with tears, and he who does not spend the midnight hours weeping and waiting for the dawn, does not know you, ye heavenly powers." On December 1st, at the end of the dinner with the Board of Trustees of St Vladimirs Seminary, knowing perhaps that his days on this earth were numbered, Fr Schmemann spoke to us in simple and direct words which I am sure penetrated every heart. His words were, reminiscent of St Pauls words recorded in II Timothy (4:6-8): "I am already on the point of being sacrificed; the time of my departure has come. I have fought the good fight, I have finished the race, I have kept the faith." Fr Schmemanns words to the Board of Trustees were his will and testament. "I am sorry," he said, "that I cannot meet with you tonight because I have just had a chemotherapy treatment. Please take good care of the Seminary. Remember our humble beginning and how hard we fought to be where we are today." Fr Schmemann uttered these words, then excused himself and vanished into the darkness of the night. There were misty eyes in the room and a strong, silent determination that the seminary will live and that the torch, which Fr Schmemann has lighted on this holy hill, will never be extinguished. On behalf of the Antiochian Orthodox Christian Archdiocese of North America, I would like to convey my sincerest condolences to Matushka Schmemann and her family, to AndrØ Schmemann, to Metropolitan Theodosius and the members of the Holy Synod, to the clergy and laity of the Orthodox Church in America, to the Board of Trustees, the faculty, the student body and the staff of St Vladimirs Seminary. Farewell, my dear friend. I am sure you have already heard these divine words. "Well done, thou good and faithful servant; you have been faithful over a little, I will set you over much; enter into the joy of your Master" (Mt 25:21). St. Vladimirs Theological Quarterly, Vol. 28, No. 1, 1984, pp. 37-39.